HeXeR is a hacker-themed mathematics puzzle game. 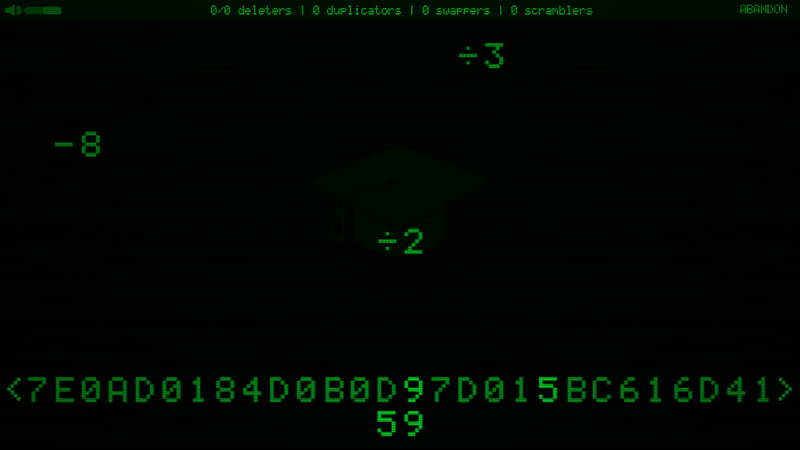 The goal of HeXeR is to achieve a specified sequence of hexadecimal numbers/letters by using mathematical operations that fall from the top of the screen. At your disposal are several powerups: deleters, which delete undesirable operations, duplicators, which allow you to duplicate numbers, swappers, which allow you to swap adjascent numbers and scramblers, which reassign a random value to a number. There are 4 levels with 4 speed settings, each of which are unlocked by earning 'bits' by beating levels. Higher levels and higher speeds result in higher rewards, but are also more challenging. Please let me know what you think of the game. Thank you for taking your time to check it out!